The iOS has become a proving ground for so many genres. Many genres flopped about like a fish out of water, clinging desperately to life, but ultimately dying, leaving behind nothing but a cold grave in arguably the biggest video game shouting contest in the mediums history, the iTunes app store. There are some genres that work on the mobile platform and then there are those that don’t. The role-playing-game genre, is one of those in between genres, where it either works, or doesn’t. ADVENA is one of the role-playing-games that should work, but ultimately, falls short due to some preventable mistakes. 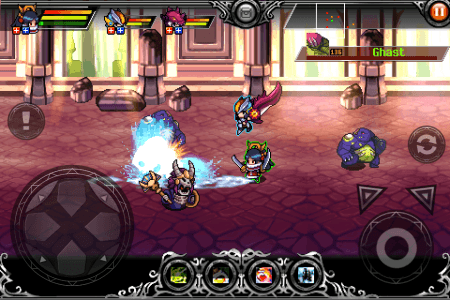 ADVENA is an action RPG, however it plays more like a side-scrolling beat-em-up with RPG elements slapped on. 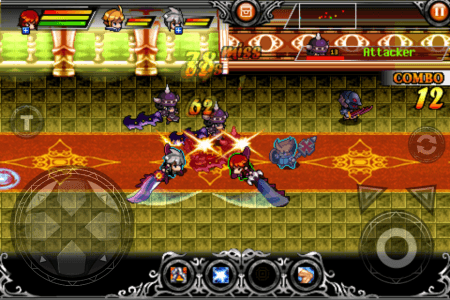 Gamevil do however have a track record of great RPGs, what with the Zenonia franchise. 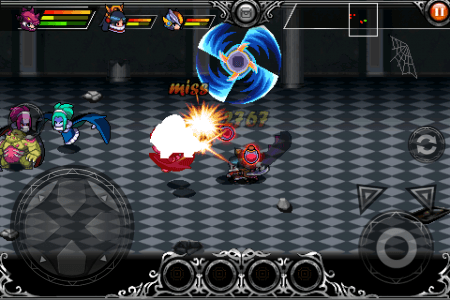 I had hoped that would translate well into ADVENA, but while the battling is fun, addictive and most of all inventive. It does suffer from a large range of problems. The most evident of which is a game-crashing glitch. This is something a lot of iOS games are afflicted with, a lot of which is due to the game over-exerting the system, or just not being able to handle what it is trying to do. Which is the case with ADVENA. 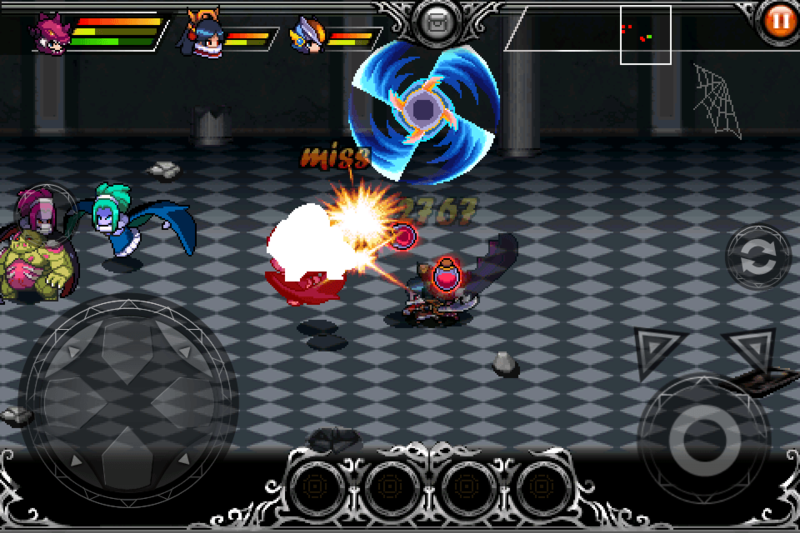 ADVENA often crashes, particularly during or after an intense fight. This is devastating for the player, because more often then not, the game has not auto saved. This causes the player to have to re-do something that was very time consuming. It can be a huge deterrent for those who enjoy sitting down and plowing through an RPG like this. As for other portions of the gameplay, it’s pretty good all around, with fast paced action as well as a plethora of character customization. Though battling can get repetitive at times. There is very little variation between enemy attacks and it does not take long to get tired of fighting against enemies with very little difference in attack pattern. But despite that it’s very inventive, for this type of game. The game controls well enough, although the control for moving your character can be a little irritating at times when you can’t allign yourself perfectly with an enemy, but it’s just a minor gripe. As a whole the controls work well. Story-wise, it’s pretty run of the mill. There is little here that you haven’t seen from an RPG game before, what with the evil brother, vengeance story-line, characters bound together by fate, etc. It’s nothing we haven’t seen before, but the way it’s told make’s it feel at the very least some what fresh. ADVENA has quite a unique visual style, with a lot of purple hues that promise a hint of magic behind the game, with just a dash of darkness thrown in. Sadly these visuals, whilst being impressive to look at, don’t have a lot of depth behind them. I know visuals are a surface thing, but adding a little meaning to the style, is warranted. The character designs are very japanese-inspired, much like ADVENA’s predecessor, Zenonia. ADVENA focuses much more on chibi character’s than Zenonia. This is a good style for ADVENA and makes it stand apart from Zenonia, while still oweing a lot to it’s preverbial “big brother”. The soundtrack of ADVENA is what you’d expect from an RPG for the iOS. It’s generic, yet still manages to effectively do the job it’s required to do. You could literally place most of these tracks onto any other RPG for the iOS and it would work effectively enough to be the backing for a game. That isn’t a good thing. It shows that it’s generic and is something that was clearly designed just to “work” not to “excel”. All-in-all, the visusla and audio of ADVENA work well enough, but lack the heart of other Gamevil titles, namely Zenonia. The biggest problem with ADVENA is that it doesn’t know what wants to be, nor was it given the love and care during it’s debugging phase that could’ve eliminated some of the glitches that afflicted the game. Also unlike Zenonia, it doesn’t ever break through into classic status. It never reaches greatness, preferring to sit comfortably in mediocrity. Which is a true shame, as this could’ve been a big step forward for Gamevil in terms of creating a new IP. If only a little more care was placed into the game it could be so much more than just “good”.